An ointment mill utilizes high shear force to reduce particle sizes, disperse agglomerates, and homogenize viscous materials. Shear force is created by three horizontally positioned rollers rotating in opposite directions and at different speeds relative to each other. 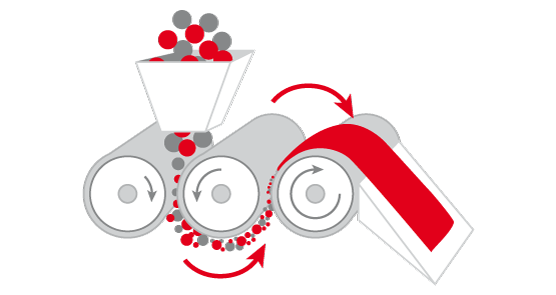 The whole product is pulled through the gap between the rollers, resulting in a precise, controllable, and narrow particle size distribution. The particle size can be easily and precisely controlled by adjusting the gap widths. The premixed product is placed in the hopper. The product is drawn between the feeding and center rollers and finely ground. Adhering to the bottom of the center roller the product is transported to the gap between the middle and front roller. In this gap, the product is homogenized and ground for the second time. The finished product is removed from the front roller by the scraper system. 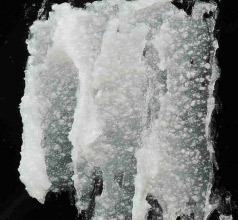 Substance processed with convention mixing procedure: crystalline substances are still clearly visible. 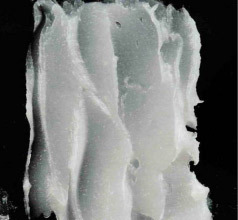 Substance processed with an EXAKT three roll mill: regular and fine consistency of the substance.